Ask any writer, and they’ll tell you: each and every kind of writing demands a different skill set. You don’t write a eulogy like you’d write a headline, and you definitely don’t write a blog post like you’d write a Tweet. Huge companies can afford to have specialized teams of writers who’ve mastered one particular kind of writing. But if you’re like most organizations, you and/or your writers have to wear many hats. If you want to be a great social media writer, especially when you’re working social media marketing campaigns into your arsenal, learning some of the basics of conversion copywriting will pay off exponentially in terms of lead generation, user-generated content collection, and overall engagement. Here are five basic principles of conversion copywriting that will serve you in good stead when you’re running social media campaigns. As you know, no two companies have an identical audience. Even when companies offer similar products, the little differences are often enough to make them appeal to vastly different segments of the population. Every single combination of demographics (age, gender, location, political affiliation) creates a different audience with unique priorities, needs, and desires. The biggest of these priorities is how they choose to spend their time: if your products are primarily for middle-aged professionals, will they have the time or the inclination to participate in a Vine contest? The campaign type itself should suit the needs and skills of your fans. If you’re trying to grow your fanbase and welcome new demographics to your audience through social campaigning, you have to think of how much your messaging can bend to reach them, too. One important way that you can use this knowledge is in your choice of language. Millennials and Generation Zers won’t appreciate a formal pitch; Boomers don’t want to read about how your products are on fleek (even though they totally are). This goes to how you format the text, too. The older your demographic, the more likely they are to have the patience to read a longer body of text. Every single word of body copy has an influence on how viewers and readers interpret the messaging you’re trying to convey. In 1974, researchers at the University of Washington wanted to study the reliability of eyewitnesses. Students were invited to watch footage of a car crash, and then guess how quickly the cars were moving when they made an impact. Except that there were five different variants of the question, and each one used a different verb. Condition 4: ‘About how fast were the cars going when they hit each other? They discovered that each verb used changed the average estimate of the crash. Language is an incredibly persuasive tool. Know what your fans want, and what they want to believe about you, and support those thoughts and feelings with your word choices. Why do people want your product? This is really two questions in one. There’s a reason why your customers are in the market for whatever kind of product you provide. Maybe they need to wash their clothes, or feel as though they’re making a difference in the world. But there’s also a reason why your fans choose your solution to that problem over your rivals. And you might know all the reasons your fans should buy your products, but they might not have anything to do with why they do choose your products over your competition. A great way to do this is to really think about the when of your social marketing campaigns. People are always looking for great gift ideas; Mother’s Day, Father’s Day, Christmas and Easter campaigns are popular with many of our clients. You might be a retailer with many product launches over the course of the year; your fans would then see you as a company that provides them with the freshest trends on the marketplace. In that case you might want to connect your campaigns with these launches, to give entrants an even more exclusive opportunity to have them first. The most important thing to underline in the design and the messaging of your campaign is to make it clear that this campaign offers a better solution than any of your competitors ever could. The prizes of your sweepstakes have to be described as the most amazing prizes that entrants can hope to win; engagement campaigns should seem to offer the most direct and powerful way to influence the future of your business. In social media marketing campaigns, perception is reality. Want to connect with customers in a way you never have before? Want to make the most compelling case for people to engage with your brand and choose to buy from you over any of your rivals? When you read that, did you think ‘Yes’? It’s the soul of conversion copywriting, and if you want your social fans to choose to enter your campaigns, a little dash of this will go a long way. To start with, do not write rhetorically. Conversion copywriting can be informal, but never easygoing. There are no ‘ifs’ in conversion copy. Writing should only be in the first or second person (I or you, not he/she/they). It’s critical that you don’t write in the passive tense. You’ll know if you’re writing in the passive tense by looking at the end of your sentences. 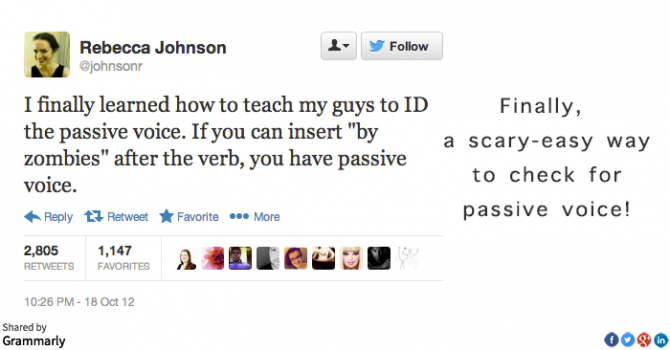 One great writing website, Grammarly, found this fantastic Tweet that explains passive voice perfectly. Can we add ‘by zombies’ to that? We have some inefficient zombie postmen, but yes, the sentence makes grammatical sense. And after the verb? “The invoice was mailed by zombies yesterday”. So this sentence is passive. To make it active, you have to make it in first or second person. Active writing leaves no room for doubt. Passive writing takes empowerment out of writing by denying that it was ever necessary. The active voice isn’t just essential for your campaign’s body copy. Making the title of the campaign active is a great way to instantly communicate the benefit and remind your fans that this is something for them to actively participate in. This is the reason why many campaigns’ titles have a verb as the first word, like ‘Enter’, ‘Win’, ‘Retweet’ or ‘Share’. Opening with the verb also sets the point of view for all the body copy in the second person. With the title setting the tone, you’ll find that most social marketing body copy tells you what you need to know so that you have a chance to win. When you use active writing in your social marketing copy, your fans will read actively, and be more likely to engage with your campaign. Your fans are busy and easily distracted by the thousands of other things they can access on social media. If you don’t engage with them now with your social media campaigns, they might find a competitor who will. To make someone act now, you have to imply that there will be consequences if they choose to wait. Is your campaign the only way that entrants have a chance to win your prize for free? Is it an opportunity that won’t last forever? No social media campaign does last forever. Emphasizing that your marketing campaigns are temporary impels visitors to participate while they can. Another way to imply scarcity is to emphasize how many people would want what you’re offering. People like doing what other people are doing, and they don’t want to be the last one to do it. You’ll often see this kind of conversion writing around webinars. Watching the webinar live is a once-in-a-lifetime chance to learn how experts ply their trade. Watching the video once it’s posted to the company’s resources is how viewers can learn the exclusive secrets that countless viewers are already making part of their business practices. The consequences don’t have to seem dire—they aren’t dire. Mafiosi are not going to come to a hesitant fan’s house and threaten to bust their kneecaps. One way to imply the consequences of ignoring the campaign without coming on too strong is to really emphasize the benefits of winning, and how they can’t belong to to the potential entrant unless they snap that picture or fill out that form. There shouldn’t just be consequences for fans ignoring your campaigns—if there can be an extra incentive for fans entering now, you should include it. You might want to offer an exclusive offer for your online store if you’re a retailer, or a coupon if you’re in consumer-packaged goods. If your organization has sponsors or partners, find out if they’d be willing to collaborate with you on something special. You don’t need to spend hours reading blogs, or hundreds on expensive copywriting courses. These five tips will help you start maximizing the conversion of your campaigns. Think there’s something we missed? Tell us in the comments below. More questions about Hootsuite campaigns? Request a demo today.